are as incredible as the views. your perspective, inside and out. Getting there is part of the adventure. Gaze at over 43,000 tons of concrete and steel making an iconic, elegant arc 63 stories high into the Midwest sky. 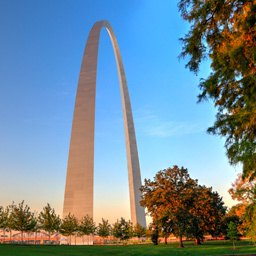 Shaped by the inspired design of Finnish-America architect Eero Saarinen, the Gateway Arch celebrates the westward expansion of the United States and the pioneers who made it possible. Since its completion in 1965, the monument has taken millions of visitors on the trip to the top to enjoy stunning views stretching up to 30 miles to the east and west. Begin your tour with our new, interactive pre-boarding exhibits featuring 60s era animation and Gateway Arch trivia. Then, be transported 630 feet to the top of America’s tallest man-made monument. Each tram tour has an anticipated duration of 45-60 minutes. For the best experience, purchase your Tram Ride to the Top tickets before you visit. Start planning your Gateway Arch adventure now. Get a sneak peek of the Tram Ride to the Top! Please Note: The Tram Ride to the Top of the Gateway Arch is not fully accessible for guests with mobility impairments, as no wheelchairs, scooters or strollers are permitted on the Observation Deck. To reach the top and return, you must be able to manage at least 96 steps, divided into six flights, and you may need to stand for 30­–60 minutes. No seating or restrooms are located at the top of the Arch. Trace the story of the Native Americans, explorers, pioneers, and rebels who made America possible. 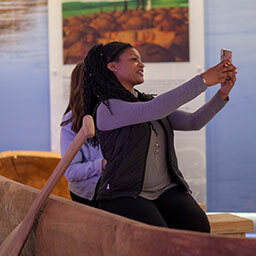 Featuring 201 years of history within six themed exhibit areas, this innovative and interactive museum celebrates America’s pioneering spirit and explains the westward expansion of the United States with an emphasis on St. Louis’ role in that era. The galleries span from 1764 to 1965 with topics covering Colonial St. Louis, Jefferson’s Vision, Manifest Destiny, The Riverfront Era, New Frontiers, and Building the Gateway Arch. Learn more about the Museum Galleries. Cruise through time on the Mighty Mississippi. Travel through time on a replica 19th century paddle-wheel riverboat. Day or night, the Riverboats at the Gateway Arch offer stunning skyline views that have been voted Best in St. Louis. With a variety of sightseeing, dinner, and specialty outings to choose from, a riverboat cruise makes a unique and relaxing way to experience the Gateway Arch and downtown St. Louis. 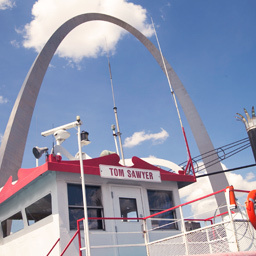 Brought to the St. Louis riverfront in 1964, the Becky Thatcher and the Tom Sawyer were originally used to take curious sightseers out on the river to view the construction of the Gateway Arch. While the city may have changed since then, the views of the Gateway Arch are as impressive as ever. Walk the halls where ordinary Americans made civil rights history. Built in 1839, the Old Courthouse is a prime example of mid-19th century federal architecture. But it is two landmark cases that secure its place in history. 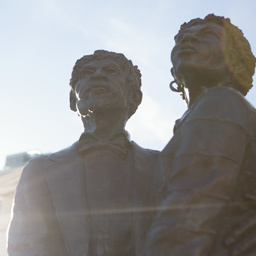 Beginning in 1847, the enslaved Dred Scott twice sued for his and his wife Harriet’s freedom. But, the U.S. Supreme Court decided against them, ruling that African-Americans were not citizens and had no right to sue. In 1873, St. Louis suffragette Virginia Minor and her husband filed a civil suit arguing for women’s right to vote. Although their suit was denied, they brought great attention to the fight for voting rights for all U.S. citizens. To get the complete Gateway Arch experience, plan time to enjoy one or all of these additional activities. The stories behind the Gateway Arch are just as incredible as the views. Learn more about the history and meaning of this one-of-a-kind national memorial.